Lamai Bay View Resort is set on a hill that gently slopes to the sea to our private beach. Located at one of the most beautiful spots on Samui with stunning views over the granite rocks in the ocean. A short distance from the main road between Lamai and Chaweng, just 2 kms from Lamai centre. Lamai Bay View Resort offers 26 separate bungalows on an area of 6,000 square meters, guaranteeing real privacy and an undisturbed holiday. 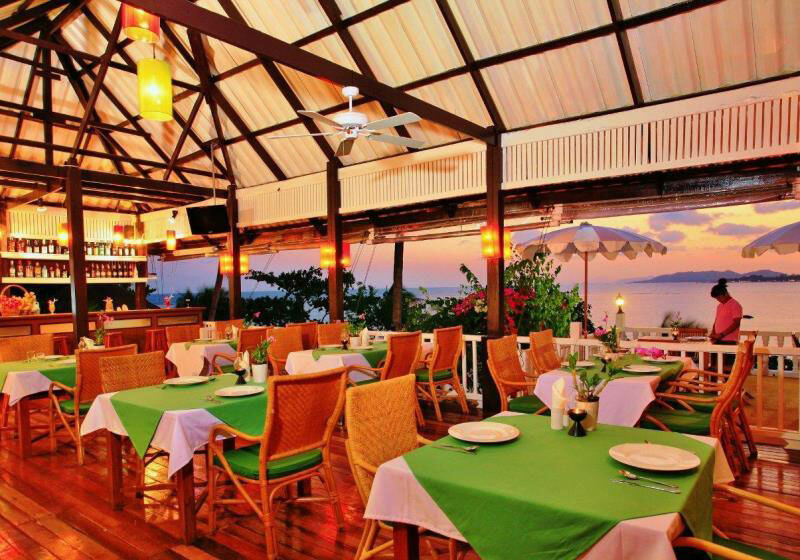 Our restaurant is on a hillside with a panoramic sea view. Authentic Thai food is lovingly prepared to guests wishes and served in the homely restaurant. Of course European food is available for those who prefer to eat as though they are at home. All dishes are prepared with ingredients brought fresh from the Samui markets and from our own organic garden. Short Description: Lamai Bay View Resort is set on a hill that gently slopes to the sea to our private beach. Located at one of the most beautiful spots on Samui with stunning views over the granite rocks in the ocean. A short distance from the main road between Lamai and Chaweng, just 2 kms from Lamai centre.